Attempting to master the craft of breeding and raising healthy fish can take some effort, but once you are able to successfully maintain healthy fish, you may think about breeding them and selling them for a profit. Sucker fish are one of the easier types of fish to successfully breed. Although there are many types of sucker fish, the same basic techniques apply to all types. Purchase at least one 1 male and 1 female sucker fish for your tank. Since the male and female characteristics can vary with sucker fish, it is best to ask a pet store professional on how to differentiate the two. Typically, the male fish are more colorful than the females. Form a location in the tank for a successful spawn to happen. A clean, old coffee can, a small flower pot positioned on its side, or a piece of old driftwood may all serve as appropriate breeding grounds. The male usually uses one of these tank ornaments for a breeding location. 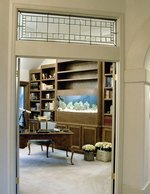 Complete a 75 percent water change on the aquarium to drop the temperature from 75 degrees to 65 degrees. Sucker fish usually spawn in the fall season and this mimics the temperature during that time. Search for eggs in the coffee can or whatever item you left in the aquarium for the fish to spawn in. Allow a few days for the fish to spawn. If it is difficult to see the eggs, see if the male sucker fish is getting protective of the cave. This is a good indication that there are eggs. It should take about 10 days or so until the eggs hatch. Drop several small pieces of vegetables into the aquarium for the adult fish and maturing fish to feed on. Either separate the vegetables by hand or with a knife. Vegetables such as broccoli, green beans, romaine lettuce or peas should suffice. Push the vegetables to the bottom of the tank with a fork if necessary. Transfer the maturing fish to a temporary tank to protect them from being eaten by the adult fish.